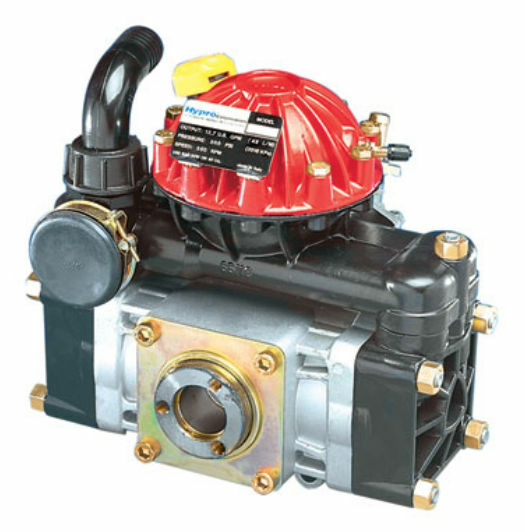 These 2 diaphragm, epoxy-coated pumps achieve up to 14 gpm (53 lpm) and 580 psi (40 bar). This series includes models 9910-D50, 9910-D50AP-A and 9910-D50-B. Pressure and output are designed for optimum performance of small to medium-sized sprayers. Pentair Hypro medium pressure diaphragm pumps can be adapted for male 1-3/8" splined shaft, female 1-3/8" splined shaft, 1" solid shaft, or gear reduction drive options. Pumps include a pulsation dampener.